There hasn't been a decent 'Predator' movie since the original. Danny Glover's sequel was pretty awful and to be honest I didn't even bother with either 'AVP' or 'Requiem'. So to finally see some promise in a 'Predator' related film is a breath of fresh air. From what sounded like a dream script written by Rodriguez in 1995 comes this sequel that is actually worthy of being talked about in direct relation with the original film. 'Predators' echoes the 1987 film quite heavily, from its jungle like atmosphere to the team of killers, even elements of the music are the same. 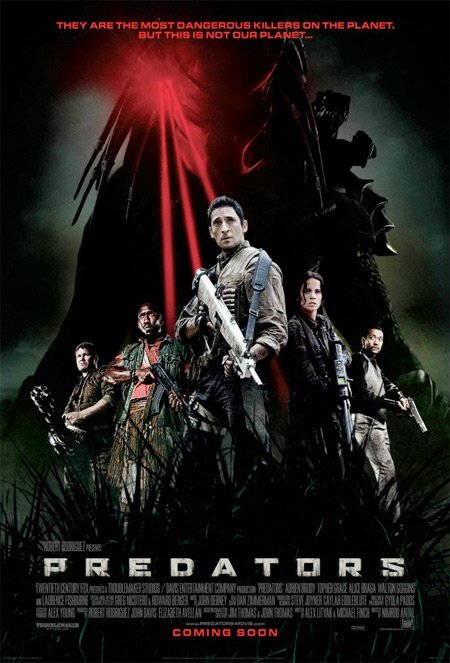 This is an ensemble effort with a clear lead and it plays out much like what we expect but with a twist in the original concept of our human protagonists being in predator territory. This widens the scope of the film considerably and adds reason to introduce more alien characters as well as new kinds of predators. What lifts the film above being a kind of rip off from every other monster film is the caliber of acting Antal has assembled here. I am always weary of Brody, but here he does well and we can see he is completely committed to the role. Its also nice to see Alice Braga getting some serious screen time and Topher Grace turns in one of the best performances in the film. It is not only the banter between these players that keeps the film moving forward at a perfect pace, but it is the way in which most of them have been carves out as individuals in their own right. We aren't necessarily always getting the stock characters here and that is what I found most refreshing about this. Do we need the story to be fleshed out a little more? Yes. Why were these specific people chosen? It gives an explanation, yet it doesn't make much sense. It is made to sound more random when it is obvious from the get-go each has been chosen for a specific reason. What is going on within the predator community? All of this is vaguely explained through Laurence Fishburne's brilliant yet comic turn as the player who has been and seen more than anyone else. It is an interesting piece and easily the most intriguing piece of the film, but the rest is full of gory, bloody deaths and fast-paced action sequences. Not to mention the film is gorgeous to look at. The colors and tone are pitch-perfect. No, the new 'Predators' might not always give us the answers to some of its loose ends, but it is good fun and what more could you ask for? Its the best 'Predator' film in 20 years.